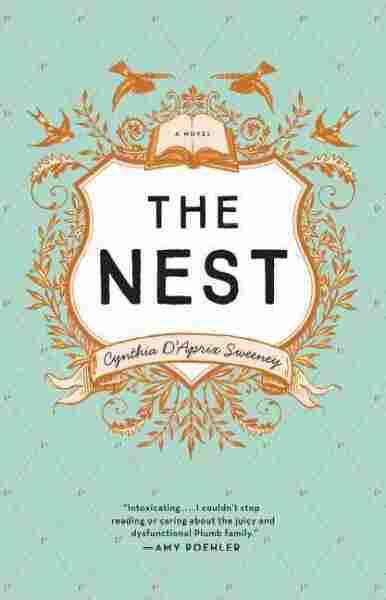 Humor And Heart Fill 'The Nest' Cynthia D'Aprix Sweeney's debut novel, The Nest, is a funny family drama about a group of adult siblings squabbling over a long-awaited trust fund that's gotten unexpectedly alrger. Trillions of dollars will be passed from one generation to the other in the form of inheritance over the next few decades. In her funny debut novel, Cynthia D'Aprix Sweeney explores the idea of how one possible inheritance affects the four adult siblings of the Plumb family. They've spent their lives awaiting the modest trust fund they've nicknamed "the nest." Their father, Leonard Sr., has set it up to be dispersed once Melody, the youngest, turned 40. But then dies unexpectedly of a heart attack — and those funds eventually grow. A lot. And the siblings start fighting over them. Sweeney tells NPR's Kelly McEvers she got the idea for the book while walking through Manhattan one day, on her way to meet her own family for brunch. "I was noticing all of these people sitting in the window with their drinks, on every street corner," she says. "And I just had an image in my head of family members who are about to get together, but they're having a separate drink ...and the image really stuck with me. And I just started thinking about who the people would be and why they needed courage to see one another, and why they couldn't drink in front of one of another, and what was difficult about this meeting they were about to have. And once I started started answering those questions, that's how the story started to take shape." We all inherit something when we're born, and that's a place in a family narrative. And that's what I really think the book is about. You just become a character in the story that you have no control over, including who the other people in the story are, including your place in the story and sort of how you're expected to play out the expectations of family. We all inherit something when we're born, and that's a place in a family narrative. And that's what I really think the book is about. I've been asked a lot why it took me so long to write fiction. You didn't go to college to be an artist. You know, I didn't know people who had the luxury of pursuing an artistic life. It was really expected that you needed a job to support yourself and to support your family. And I do think that's changed a little bit. And I do think that part of that is parents supporting their kids well into their adulthood and, you know, allowing them more creative pursuits. Whether that's a great thing or a hampering thing, I guess depends on your perspective and who you are. I don't know. Those are all really, really hard questions, and they're really personal. And, you know, my parents, who thankfully are both still alive, and they told us all the time when we were little when we die and there is no money because there won't be ... Take out all the photo albums of all of our family vacations and understand that that — that is your inheritance. And I love that. And, you know, will I do that with my own children? I don't know. There is great value in not being able to — not being able to afford stuff, to having to wait and work really hard to get something. I don't know that I have any answers, but I do think that in writing the book I was juggling all those questions.